In the FY 2002 Senate Appropriations Subcommittee for Labor-HHS Education and the Conference Committee Report for the FY 2002 Labor-HHS Appropriation, Congress requested that the Secretaries of Health and Human Services and Labor identify the causes of the "shortage" of frontline workers (registered and licensed practical nurses, certified nurse aides and other direct care workers) in long-term care settings such as nursing homes, assisted living and home health care. The Subcommittee and Committee requested that the Department of Labor (DOL) and Department of Health and Human Services (HHS) make comprehensive recommendations to the respective Committees to address the increasing demand of an aging baby boomer generation. HHS's recent meetings with state and local policy makers, long-term care providers, direct care workers, researchers, and labor economists on recruitment and retention of direct care workers in long-term care. Topics included: (1) extrinsic rewards and incentives (such as wage and fringe benefits), (2) workplace culture (organizational structures, social factors, physical settings, environmental modifications and technology), and (3) expanding labor pools of direct care workers. Survey data from both Departments on the supply of and demand for direct care workers in long-term care settings, including DOL's industry and occupational employment data from its Occupational Outlook Program and HHS data on the direct care workforce from the National Nursing Survey and the National Home and Hospice Care Study. New projections were developed for some occupational groups. Research and practice literature related to the shortage of long-term care workers, including information from surveys of direct care workers, and a review of state-sponsored efforts and provider surveys. 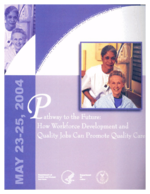 In 2000, approximately 1.9 million direct care workers (defined in this report as including registered nurses (RNs), licensed practical and vocational nurses, nurse aides (NAs), home health and personal care workers) provided care to 15 million Americans in long-term care settings (defined in this report as including nursing and personal care facilities, residential care facilities, and home health care services).3 The Bureau of Labor Statistics (BLS) estimates that by 2010, direct care worker jobs in long-term care settings should grow by about 800,000 jobs, or roughly 45 percent.4 Paraprofessional long-term care employment will account for 8 percent of the estimated increase in the nation's jobs for workers in occupations generally requiring only short-term on-the-job training. According to estimates developed by HHS's Office of the Assistant Secretary for Planning and Evaluation (ASPE), after 2010, the demand for direct care workers in long-term care settings becomes even greater as the baby boomers reach age 85, beginning in 2030. ASPE estimates project the demand for direct care workers to grow to approximately 5.7-6.6 million workers5 in 2050, an increase in the current demand for workers of between 3.8 million and 4.6 million (200 percent and 242 percent respectively). This increase in demand will be occurring at a time when the supply of workers who have traditionally filled these jobs is expected to increase only slightly. These projections indicate that it is critical to retain existing long-term care workers and attract new ones. Since many industries will be competing for the supply of workers, pay and working conditions will play a key role in attracting new workers and consequently influencing the supply of long-term care services. Providing adequate levels of high quality, compassionate care will require sustained effort by many actors. While the Federal Government has an important role to play, much of what needs to be done will require action on the part of current and new employers who will expand and alter the market itself and shape new solutions. Other solutions will inevitably be crafted by state and local governments, health care providers and industry associations, education and training institutions, workforce investment systems, faith-based organizations, and workers themselves. The full paper is available online at http://aspe.hhs.gov/daltcp/reports/ltcwork.htm. Elderly Long-Term Care Projections, prepared by the Lewin Group for ASPE, draft July 15, 2002. Estimates developed by the ASPE Office of Disability, Aging and Long-Term Care Policy, using data from the 1994 National Health Interview Survey, and 2001 Census population projection. For the institutionalized population: 1998 Residential Information Systems Project, 1996 Medical Expenditure Panel Survey. Bureau of Labor Statistics, National Employment Matrix, 2000-2010. This estimate varies due to different assumptions of the growth rate of home health care. See discussion associated with Table 7 for a more in depth explanation.